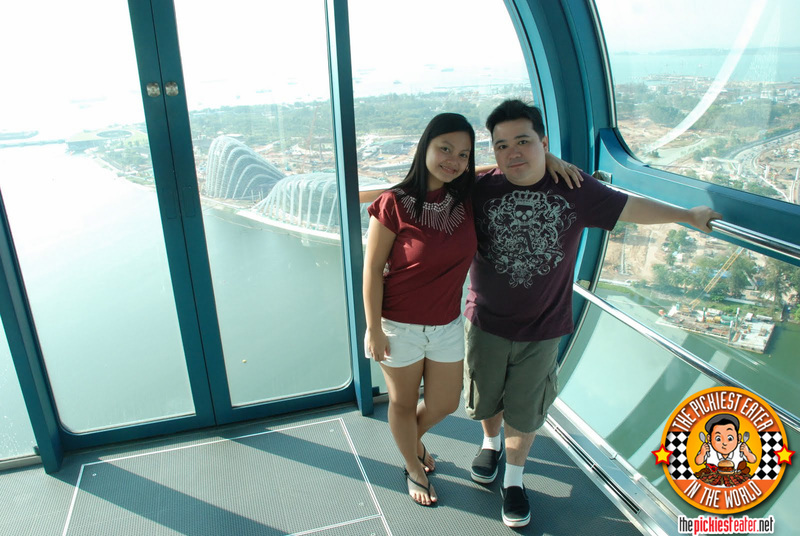 THE PICKIEST EATER IN THE WORLD: SINGAPORE DAY 3: ON TOP OF THE WORLD, IN THE SINGAPORE FLYER! SINGAPORE DAY 3: ON TOP OF THE WORLD, IN THE SINGAPORE FLYER! THE PICKIEST EATER GOES TO THE TOP OF THE WORLD! I'm afraid of heights. I think that's why God didn't make me tall. Wait, I take that back. I'm not afraid of heights, per se. I'm afraid of Ferris Wheels. Strange, no? So what exactly would possess me to take a ride on The Singapore Flyer, the tallest Ferris Wheel in the entire world? Well, the girls said they wanted to do it, so I had to man up or be left behind. Besides, the ticket was a package deal with our Duck Tour, so I'd be wasting money if I skipped it. 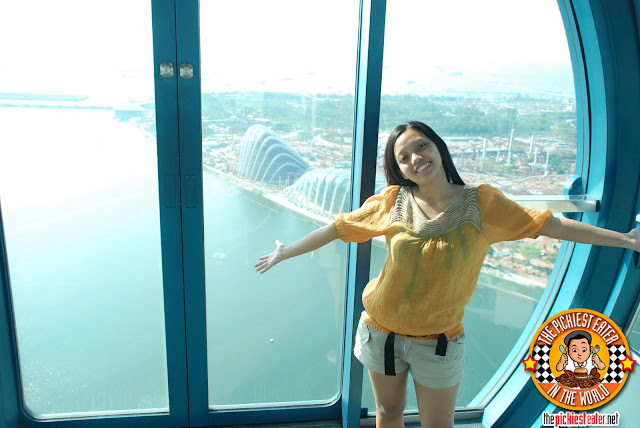 And I'm glad I did, because the view of the city was absolutely breathtaking, that every tourist should not miss! 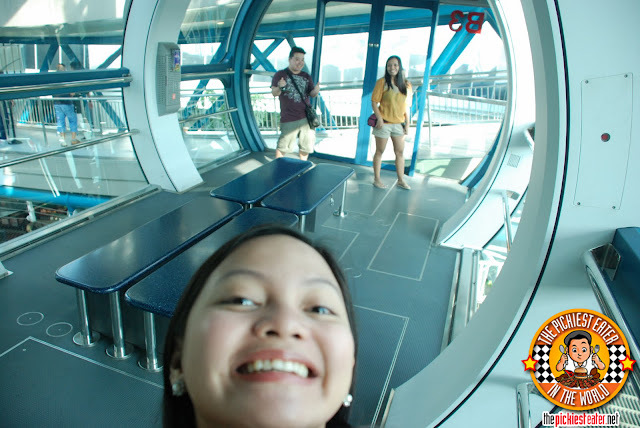 As planned, we went to the Singapore Flyer rather early so we were probably the first ones there. We were lucky we had the whole "capsule" to ourselves! Which was good because it would've been embarrassing if we had total strangers there seeing me freak out. I'm honestly not sure if they fill up the capsule or if it's by groups, but from what I was told, it can seat up to 28 people. The last time I went on the Ferris Wheel of Enchanted Kingdom, I started freaking out when we were near the top. Even though we were safely seated and the car wasn't rocking, there was just something that tugged on the pit of my stomach and made me feel like panicking. The problem was, I couldn't.. because I was in car full of girls, who, unfortunately, were not panicking at all. In fact, they were laughing while and swapping stories, like they were in sitting safely with their feet firmly on the ground of a Starbucks. Luckily I managed to hold it together until we go down. To be honest, I didn't really think about my fear of Ferris Wheels at first, until Rina brought it up. The moment she reminded me about my Enchanted Kingdom episode. Chaikka showing off.. just wait till we get to Sentosa..
After awhile though, especially with the comfort and stability of the capsule, you realize that the Singapore Flyer is rather safe, and there's no way that you could fall out (Not like the pesky EK Ferris wheel that I don't want to talk about). A ticket is around SG$30 and the ride lasts for about 30 minutes. 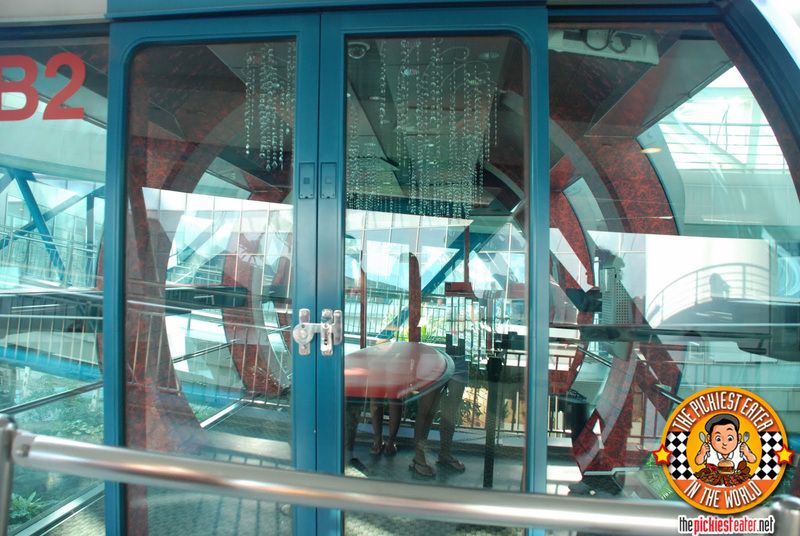 As i mentioned in the video above (in case you were too lazy to watch it), Capsules are often rented out for Photo Opportunities, such as fashion pictorials and pre-nuptials. The view, as you would expect, was spectacular. You get a 360 degree view of the city, and get to see all the highlights. At the moment, The Singapore Flyer is the biggest Ferris Wheel in the world. According to our Duck Tour guide, The Great Berlin Wheel is set to open next year in Berlin, Germany (duh) and that would supplant the Singapore Flyer as the tallest Ferris Wheel in the world. They're also building one in Beijing as well, The Beijing Great Wheel, that would top all of those. 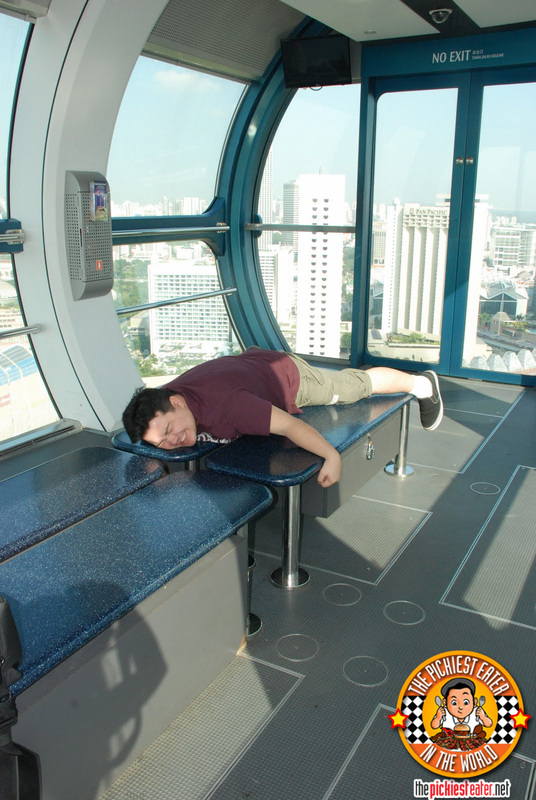 Despite the near change-of-shorts experience, I must say that The Singapore Flyer is something that you definitely should experience at least once in your life! SINGAPORE DAY 3: THE GRAND FINALE AT IKEA!